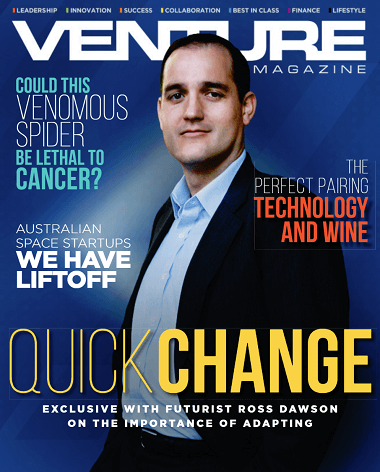 I was pleased to discover I am on the cover of the new issue of Venture magazine! “It is intrinsically human to want to create, to invent, to make things beyond what we’ve had before, and there will be no end to this.” So says futurist, author, and strategist Ross Dawson, who advises global companies on make-or-break issues that ultimately shape the course of human progress. We have got to where we are now in human history because inventing, creating, seeking something more is a core part of what it is to be human. However it is clear that taken in some directions this becomes destructive. Wanting more personal wealth without end leads to disregard for the impact on others. In a highly populous world there are limits to our ability to exploit many natural resources. It is intrinsically human to want more. But we can transform that desire for us to want better, not simply more of what we have had before. I think we are seeing that transformation, where many people aspire to more, but increasingly their primary aspiration is that more people on the planet have the basic resources they need, education, opportunity, and human connection. This is happening, but it has to happen faster. We can’t deny our humanity. But if we turn our desire for progress to betterment rather than material wealth, humanity has every chance of a prosperous future. Read the article for discussion of many other big-picture frames on our future and how we can create it.